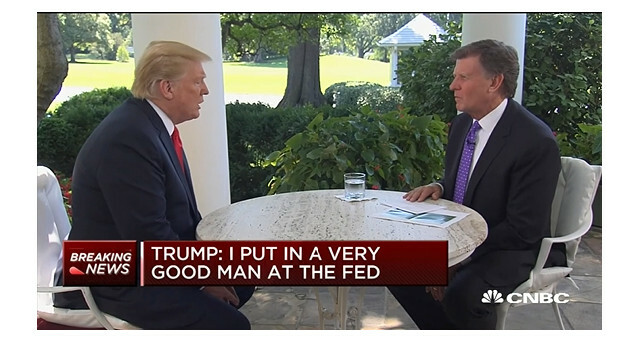 President Trump said in an interview with CNBC’s Joe Kernan yesterday morning he “does not agree”, is not “thrilled” or “happy” with the FOMC’s interest rate hikes. The full interview and transcripts will be available tomorrow. President Trump hit them all in this interview, from the Fed to the Euro and Chinese RMB (“dropping like a rock”). It doesn’t surprise us. Recall our March 21st post, The Biggest Risk At The Fed. But this doesn’t concern us as much as the Fed’s independence. That is we are worried more about the freedom from White House pressure and interference in conducting monetary policy than getting a few bps wrong on the Fed Funds rate. This is especially true and relevant given the strongman tendencies and lack of respect for institutional norms of the current president. We were assured by Fed insiders shortly after that post in March Chairman Jerome Powell was tough and we should not underestimate his independence. He has thus far proven to be an extraordinarily competent Fed leader. Moreover, the president seems to have appointed very competent and independent Board governors to fill the many vacancies on the FRB. Other than committing another faux pas by publicly criticizing the Fed - and it really wasn’t that critical - the president’s comments, taken in isolation, were relatively benign and does not pose a threat to central bank independence, in our opinion. But the totality and cumulative mistakes of amateur hour at the White House, from foreign to domestic economic policy, are slowly chipping away at the world’s confidence in the management of America, Inc..
Just look at the rise of crypto and mobile payments in the past decade? Who is to say that a replacement for the dollar won’t come along in the next few years? That would be a huge game changer and could render the U.S.economy to the dustbin of highly indebted countries, with large deficits, and irresponsible monetary policies. And you know who they are. Is Trump Setting Up The Fed As The Fall Guy? CNBC’s Steve Liesman raises an interesting question: is Trump setting up the Fed to take the fall for his trade policies gone bad? Farmers are really starting to feel the pain. As Dale grain and beef cattle farmer Dennis Whitsitt watches his crops grow in the fields, he also watches grain prices tumble as tariffs between the U.S. and several other countries take effect. The Trump administration began talking about imposing tariffs on Chinese imports in January, starting what has come to be called a trade war. Trump’s threats led China to threaten retaliatory tariffs on U.S. goods, including soybeans and pork. Both countries enacted the threatened tariffs on July 6. The administration also imposed tariffs on goods from the European Union, Canada and Mexico, leading those countries to impose retaliatory tariffs as well. Those tariffs also included farm goods as foreign leaders looked to hurt areas that voted for Trump. In Whitsitt’s opinion, the tariffs have hit their mark, as far as farmers go. “It doesn’t seem like a good strategy,” Whitsitt said of the trade war. “I couldn’t care less” — Are you frickin’ kidding me? As we posted last night, the president’s not even ambiguous (double negative) comments on coming to the defense of a NATO country, coupled with the U.S. public, which some could read, acquiescence to the Russian annexation of Crimea only increases the risks that China moves on Taiwan. The U.S. would then have to decide if it willing to “send its boys” to defend Taiwan and enter World War III. As Washington pundits and government officials debate President Trump’s meeting with Russian President Vladimir Putin in Helsinki, China is busy sending a strategic message to the United States with large-scale war games near Taiwan. China on Wednesday kicked off live-fire drills in the East China Sea north of Taiwan in an area simulating the size of the island state — a not-so-subtle message to the country Beijing regards as a breakaway province. The military maneuvers at sea also will be held not too far to the west of the Japanese island of Okinawa, home to U.S. military forces. The six-day war games were announced Monday in a sea closure zone that warned all vessels to stay clear of the area, where Chinese ships are firing missiles and other weaponry. The exercises are designed to warn Taiwan, Chinese military expert Song Zhongping, told the newspaper. “The drill’s main objective is to send a serious warning to Taiwan separatists,” Mr. Song said. According to another Chinese military expert quoted by Global Times, the East China Sea is viewed by the Chinese military as the main battle zone if war breaks out. The expert, who was not named, said this week’s drills are larger than in the past and require more troops and weapons. The maneuvers will test the Chinese military’s combat capabilities, tactics and training methods and its new weapons and hardware.